The term voltage regulation identifies the characteristic of the voltage change in the transformer with loading. The voltage regulation of the transformer is defined as the arithmetical difference in the secondary terminal voltage between no-load (I2=0) and full rated load (I2 = I2fl) at a given power factor with the same value of primary voltage for both rated load and no-load. The numerical difference between no-load and full-load voltage is called inherent voltage regulation. Where V2fl = rated secondary terminal voltage at rated load. V2nl = no load secondary terminal voltage with the same value of primary voltage for both rated load and no load. We can say that voltage regulation is an important measure for the performance of the transformer. We can specify the limits of the transformer in terms of voltage regulation. 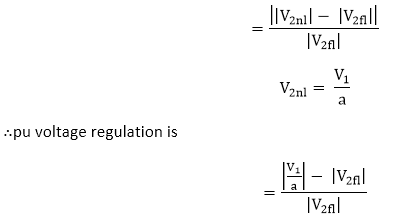 We can calculate the voltage regulation of a transformer in terms of circuit parameters. 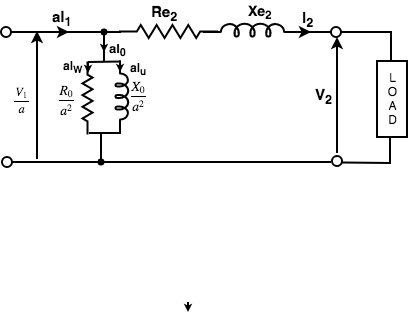 The equivalent circuit diagram of a transformer referred to secondary is shown below. Or we can say that it is the ratio of the difference between the voltages at no load and full load to the voltage at full load. Transformer efficiency (η) can be explained as the ratio of the output power to the input power. As we know that in a transformer there is no rotational part so there are no rotational losses such as windings and frictional losses in a rotating machine. Therefore, we can obtain a maximum efficiency as high as 99% in a well-designed transformer. What is all day (or energy) efficiency of a transformer? The ratio of the energy output of 24-hour to the energy input of a 24-hour period is called the All-day efficiency of a transformer. 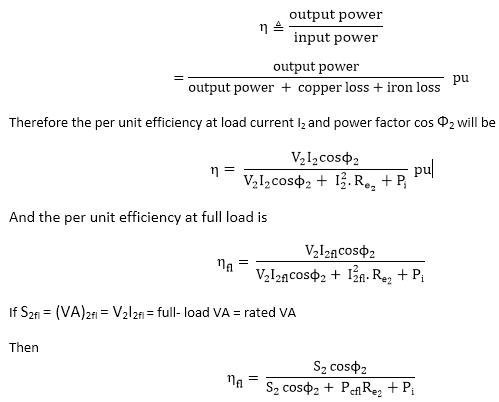 If we know the load cycle of the transformer, then all day efficiency can easily be determined.